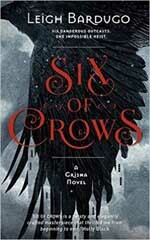 Six of Crows led the bestseller list in the New York Times for weeks – sadly it’s barely available in bookshops in the UK. This is a shame for it is certainly the best book I have read all year. This amazing Dickensian/Baltic heist novel is exciting from the word go and even if you haven’t read any of the Grisha novels (Ruin & Rising) by Bardugo you can start here and just be plain impressed by her world building and deft characterisation. With snappy dialogue and wonderful young, incredibly skilled but deeply scarred individuals you warm to all of them immediately, even knowing that they are all criminals in the eyes of the law. But of course the ‘law’ is corrupt and compared with the authorities our would-be thieves are saints of the first order. Kaz Brekker is the lead character, owner of a second-rate gambling den and leader of a gang called the Dregs in the dockside area of Ketterdam. He has quite a reputation for one so young. He is approached by a rich merchant worried about a new drug that is on the market. It could ruin the world economy and specifically all those who call themselves Grisha. The Grisha are a generally secret sect who have extraordinary skills and are feared by many. The drug can make them all-powerful, but it is addictive and before it kills them, can make them susceptible to control by those with dubious motives. The scientist who developed this is being held in the Ice Court the most well defended place on the planet. The merchant wants Kaz and his team to enter the fortress and extract the scientist alive. It is an impossible task and will certainly end up with Kaz and or all of his team being killed. Kaz accepts the challenge because he wants revenge on the man who killed his brother. In his team he has a valuable runaway, a petite waif who can never be seen, a Grisha heartrender, a master escaper, a sharpshooter who is a gambling addict and he expects complete loyalty. Ahead of them lies betrayal, double crossings, plan making, everything you’d expect from the best heist story. The clash of personalities is very real, but you find yourself at one with them every step of the way. Bardugo creates this special Baltic world of freezing temperatures, cruel seas and people at perpetual war with each other and the Grisha, the ones they fear the most. Bardugo gives us the backstories of each of her characters with such skill you cannot but root for them all to succeed. Even when we stop for injury time we are spellbound. The scenes in the Ice Court are spectacular and every step of the way you are thinking what a fantastic movie this would make. Six of Crows is the first in the series and I would seriously advise you buy it and then tell everyone what they are missing. It’s YA but beats most adult fiction into a cocked hat. Two books, disappointing covers, but what a brilliant fantasy duo – that draws on Tolkien, Catherine Fisher, Tolstoy, Russian folktales, but makes it all her own and completely original.